The topic of wettability (measured in terms of contact angle) is of tremendous interest from both fundamental and applied points of view, Wettability plays an essential role in many industrial processes, so an understanding of factors dictating wettability and how to modulate it is of paramount importance. In the last years there has been an explosive interest in superhydrophobic surfaces (i.e., surfaces with water contact angle of 150A Degrees or higher) because of their relevance/importance in many areas ranging from self-cleaning windows to nanofluidics. Also recently there has been heightened activity in the field of electrowetting. Contact Angle, Wettability and Adhesion, Volume 6 is divided into four parts: Part 1: Fundamental Aspects; Part 2: Wettability Control/Modification; Part 3: Superhydrophobic Surfaces; and Part 4: Surface Free Energy and Relevance of Wettability in Adhesion. The topics covered include: a guide to the equilibrium contact angles maze: fundamental aspects of wetting of rough and chemically heterogeneous surfaces: work of adhesion for rock-oil-brine systems; Is the world basic? ; wettability control/modification using various approaches; superhydrophobic surfaces and ways to impart superhydrophobicity; adsorption on superhydrophobic surfaces; solid surface energy determination; surface modification of different materials; relevance of wettability and adhesion aspects in a variety of reinforced composites. 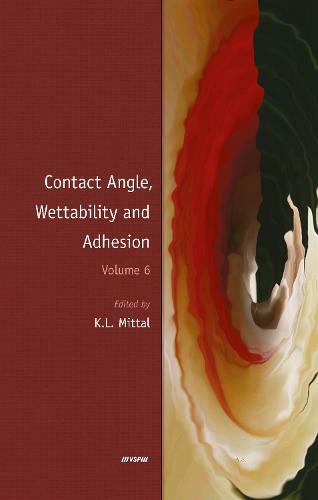 In essence, this volume reflects the cumulative wisdom of many active and renowned researchers and provides a commentary on contemporary research in the fascinating world of contact angles and wettability. This volume and its predecessors (5 volumes), containing bountiful information, will be of much value to anyone interested/involved in controlling wetting phenomena and their applications.